L arry Dandridge is the CEO, Editor, and a Senior Writer with Tigers, Vikings, and Vipers Publishing, LLC. His latest military history and action book includes 416 pages of edge-of-your-seat reading and 46 combat pictures. BLADES OF THUNDER (BOOK ONE), is an all five-star reviewed, action-packed, informative, fast selling, and non-fiction account of the US Helicopter War in Vietnam in 1968 and 1969. Four of the main characters in the book are SC heroes and ex-Army Aviators. Larry also played in ARMY WIVES as Corporal Arnold Sedowski, a Vietnam War Veteran, and he is a member of the Screen Actors Guild. LTC (Retired) Larry Dandridge is an ex-enlisted Army infantryman, aviation warrant officer aviator, and retired aviation commissioned officer. 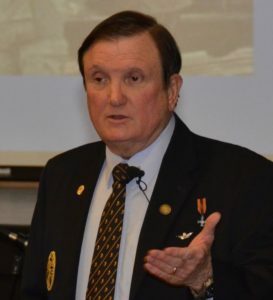 He served as an Army flight instructor, flight examiner, flight commander, maintenance test pilot, US-German negotiator, locomotive operator, procurement official, and logistician in the US Army for 24 years. Larry was severely wounded in Vietnam in 1969 flying an attack helicopter. His military awards include the Legion of Merit, Purple Heart, Vietnamese Cross of Gallantry, German Silver Cross, the Joint Meritorious Service Medal, five Meritorious Service Medals, 15 Combat Air Medals, and two Silver Quill Awards to mention a few. He is also the past president of the Association of the US Army (AUSA) Charleston, SC Chapter and the current VP for Veteran Affairs. He has led many efforts to help our military men and women, veterans, and their families to find jobs, obtain housing, and much more. Today, between writing books, Larry is a volunteer Patient Advisor, Veterans Service Officer, and Employment Assistance Officer at the Ralph H. Johnson VA Medical Center where he teaches Patient and Family Centered Care (PFCC). —— He also serves on the Customer Service Council, the Directors Veterans Service Officer (VSO) Council, and several other VA advisory councils at our local VA hospital.